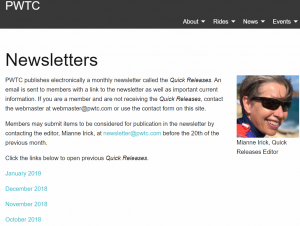 There are rumblings in the club about the new format of our monthly newsletter, the Quick Releases, so I want to address some of these complaints. Firstly, by going digital and online only, we have moved away from the dated Portable Document Format (PDF) format. 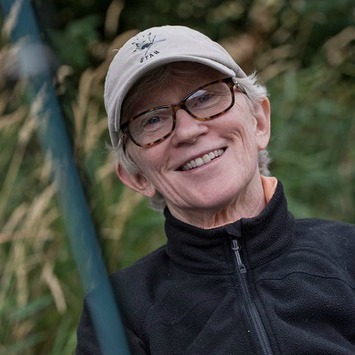 Most of us are not downloading PDFs for our bank and credit card statements, online store catalogs and brochures, and news stories on Oregon Live and the Washington Post. But why the QR you ask? Isn’t anything sacred? You say the old format is familiar, like comfortable old slippers. Perhaps, but did you know that if we miss an error in the PDF version, it is not something that can be easily remedied? Once I saw an error, a pretty serious one, but when I asked if it could be corrected, I was told that a correction would be added in a footnote in the next newsletter. You may counter that an email blast announcing a correction would suffice. Well maybe, but emails can be missed or deleted, and many people only use the online QR so will only see the original PDF. The old PDF QRs were tightly crafted as carefully as a mosaic to minimize blank spacing. Changes post-publication were not attempted. But now – spot an error? Send a QUICK and simple email to the webmaster so that the error can be readily fixed. This new format will not only allow for QUICK error correction within the story, but more efficient production by the editor, as it eliminates the need to sweat out fine details of arranging stories and varying fonts to fit a page. Like a QUICK release, the new format allows fast and easy access to each month’s content. 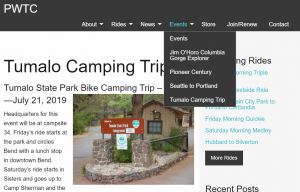 Headlines will be ‘clickable’ and stories QUICKLY accessed – Just like OregonLive, the NYTimes, the Sandy Post, and the Willamette Weekly. No more downloading and trying to remember which month you saw a particular story. The list will always be there with the associated links. This will move us forward to where we can finally have a searchable website. And finally, what about the news? That is where you come in. We have two reporters, Ann Morrow and Kathleen Hellem, but they can’t see or do it all. See something of interest to others? Submit it to our editor, Mianne Irick, by the 20th at newsletter@pwtc.com for consideration. News can be about recent club rides, but also Portland road issues, safety issues, gear news, etc. Our newsletter is only as good as the submissions. An editor’s job is to edit. Our job is to submit stuff to be edited. The new format is perhaps a work in progress, but I predict that in the very near future you may wonder why we didn’t do this sooner.